Please keep in mind that even though my video shows you how to download Windows Movie Maker 2015 it is still part of the Windows Essentials 2012 package. This means that Microsoft has not put out an updated version of Windows Movie Maker since 2012. Lucky for everyone who loves this free movie editor from Microsoft that it is Windows 10 compatible and works great in the newest Windows 10 operating system from Microsoft. It is the best movie maker that has a lot of free features for video editing any movie or video. Plus you can upload your movie creation directly from movie maker to YouTube without any additional software. 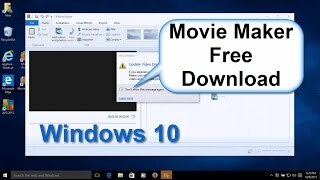 One BIG important plus about Microsoft free movie maker software is if you already know how to use this video editor for Windows 10 there is no learning cure. So you can concentrate on learning the new Windows 10 operating system and not a new free video editor. PLEASE NOTE: This is directly from Microsoft Website for downloading Windows Movie Maker: Quote “Windows Movie Maker is not supported for Windows 10, but you can still download Movie Maker if you really want it”. End of Quote. I’ve been using Windows Movie Maker on Windows 10 since it’s release and it continues to work perfectly in Windows 10 in 2016 and gives me no trouble……..Note: Windows Essentials package contains Windows Movie Maker within it. Here’s the link: https://support.microsoft.com/en-us/help/14220/windows-movie-maker-download Please Note: It no longer says Windows 10 just Windows 8.1 & Windows 7. Click on the Windows 8.1 & Windows 7 “Get it Now: It will work perfectly in Windows 10.